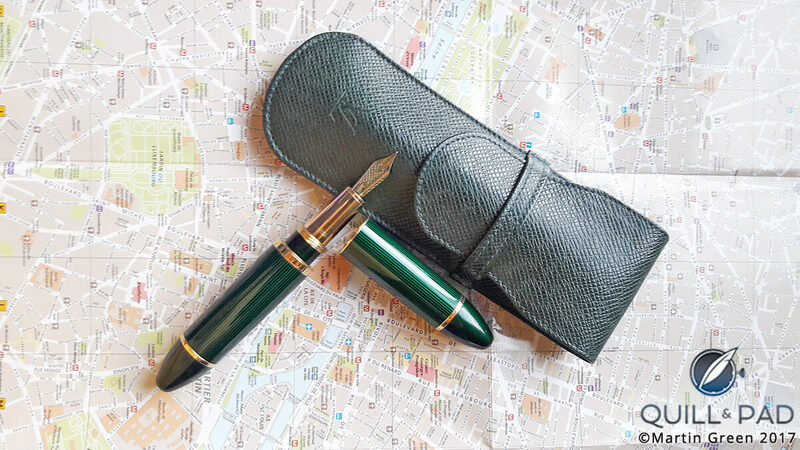 After obtaining a Delta Dolce Vita Oversized at the conclusion of my Italian period (see The Quest For My Ultimate Fountain Pen Part 2: The Italian Period), I was a very happy man. The pen served me very well, and I was in love with the looks as well as the writing experience that it provided. As usual, though, while I wasn’t looking for a replacement, it happened anyway. When you like a certain product category, interest in it remains even when you are happy with what you have. 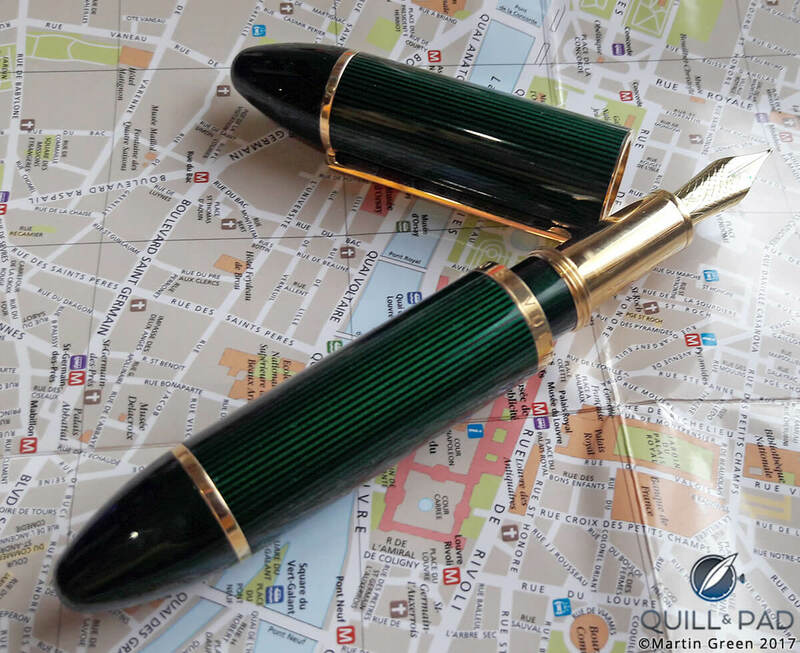 That is why, while I wanted and needed for nothing pen-wise, I kept in touch with goings-on in the world of fountain pens and was always eager to visit sellers whenever the opportunity presented itself. Once while traveling in the United States, I did just that, and one particular boutique turned out to be nothing less than a room full of treasures. In fact, all the pens present were either highly exclusive or part of a limited edition. This was not the place you would expect a bargain, yet that is what happened: it was there that I noticed a Cartier Clock Pen, new in box with papers. This pen was part of a coveted limited edition, and those oppotunities don’t come around that often. People who know me also know that I have a weak spot for the French maison and more often than not, I can be found with a Cartier timepiece on my wrist. When it comes to writing instruments, Cartier’s history is extensive, to say the least. It has maintained a tradition of producing pens with clocks for more than a century. To learn more about this, I highly recommend François Chaille’s book Cartier, Creative Writing, which the traces the entire history of Cartier pens. The owner of the boutique made me an offer I could not refuse, and the Cartier Clock Pen went home with me even though I didn’t need another writing instrument. The Dolce Vita was still serving me well, and I didn’t expect this great-looking Cartier to be a better writer. However, I have a tradition to always ink and try out all my pens at least once. This is what they are made for, so this is what you should do. I was astonished by the writing experience of the Clock Pen. The pen is quite heavy but well balanced and fitted with a very smooth-writing nib. It turned out that the heavier barrel, with a smaller diameter than the Dolce Vita oversized, worked better for me, so I had a new daily writer. Once again, all was good. The Clock Pen proved to be a delightful daily companion with the added bonus of that wonderful, Cartier-styled little clock in the cap. Time passed and it was getting close to Christmas when a small parcel was delivered to my doorstep. It contained a note from a very dear friend, wishing me Merry Christmas and announcing that he had found me the perfect Christmas gift. He wasn’t lying because when I worked my way through the bubble wrap a familiar box in red with decorative gold embellishments emerged. Upon opening, I found myself staring at a vintage 1980s Cartier fountain pen. The 1980s represented an important era for Cartier, marking the transition from a company comprising three world-famous boutiques to a true cosmopolitan brand with a very strong, international lineup. Pens were a prominent part of this movement, and from 1981 to 1984 the product manager responsible for this was none other than Philippe Léopold-Metzger, CEO of Piaget from the year 2000 until March 31, 2017 (see Do The Recent Changes At Richemont Herald A New Watch World? An Industry Insider Presents Some Hypotheses). The pen in the box before me was called Pasha, a model Cartier would later redo to make more modern in style. The choice of this model was no coincidence because a significant part of my deep affection for Cartier is focused on the Pasha. This fountain pen featured a deeply grooved body topped off with a dome-set blue sapphire cabochon referencing the crown on the Pasha watch. Where the clip is attached to the cap, two rings in different gold tones are intertwined, just like the famous Trinity ring by Cartier. In contrast, the nib is rather small and plain. But don’t let looks fool you! The writing experience was unlike anything else that I had experienced before – like true butter-smooth writing with a lot of control because your fingers are very close to the nib, and since the nib is so small they are also close to the paper. This pushed the Clock Pen back to its original position as an object of beauty, one that is only occasionally used, making the Pasha my go-to pen. Several times now I thought that my quest for the ultimate fountain pen had found a conclusion, yet right at that moment another pen presented itself, surpassing what I already thought was perfection. These events often happened by chance, and so it was with my last – or perhaps more accurately, most recent – pen. I was visiting a friend and noticed a glass holding large, thick cylinders on one of his bookshelves. A couple of them had lacquer stripes, while another one was covered in brown alligator leather; gold bands decorated all of them. When I asked what they were, he told me they were fountain pens. Of course I needed to learn more, and he showed them to me. When he unscrewed the cap of one of them, the barrel went from very thick to modestly thin with a nicely sized nib attached to it. It looked unusual, but it wrote in a heavenly manner! This seemingly strange combination gave control to the fingers, while the large end of the barrel put a nice weight where the pen rests between the fingers. I was blown away by this experience, but hardly in need of another pen. Some time passed, but the experience with that pen still burned in my memory. But there was also hesitance, and part of it was the fact that this was a product not made by Louis Cartier’s firm, but by another very famous and very French Louis: Louis Vuitton. I have a love/hate relationship with Louis Vuitton. I have seen the most stunning custom-made bags and leather goods made from its classic Epi and Taurillon leather. Unfortunately, these don’t scream LOUIS VUITTON the way many people would like, which is why the Monogram collection reigns supreme, preferably with the logos in a wide array of bold colors so that they cannot be missed. Combined with a visit to the flagship store on Paris’s Champs-Élysées, which is visually stunning, but at the time only strengthened my feelings of alienation toward the brand: splendid architecture and great products, but mainly obscured by a mob of tourists eager to buy anything with the coveted logo on it. Or so it seemed to me. But then I visited Louis Vuitton’s Cabinet d’Écriture, a pop-up store dedicated to its stationery, pens, and inks as part of its boutique at Plâce Saint-Germain des Prés; this was a very intimate place that provided insight into the rich history of Louis Vuitton when it came to these items. This was the soul that I also felt in the Louis Vuitton Cargo pen my friend showed me. Not following the masses, but a far more personal experience – one that is perhaps not shared with everyone, but has a deeper meaning within ourselves. This also sealed the deal on the Cargo fountain pen for me. However, I could not pick one up at Louis Vuitton because the green version that I wanted had been discontinued. So I had to hunt one down. The Internet truly made it much easier to do this, yet it still took some time before I was able to acquire one. Even with all those other magnificent pens, there is nothing that writes quite like a Cargo. Louis Vuitton never seemed to have made the pen for this, by the way. The few Louis Vuitton salespeople that I encountered who actually knew the pen (only a few boutiques ever sold them) all told me that the pen was mainly designed to use solely to sign important contracts and other formal documents. But underneath those dramatic looks lies a pen that wouldn’t like anything better than to write page after page, emptying convertor after convertor and inkwell after inkwell. A pen with remarkable stability and superior control, and to me the best writing – and looking – pen that I have ever used. 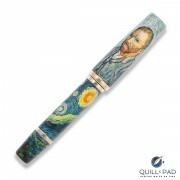 Will there be another act in my quest for the ultimate fountain pen? I doubt it since the Cargo serves me so well and I even have other fantastic pens to return to. However, one thing I learned from this quest is that you can never say never . . .